Rugged plastic housing with adjustable feet to give individual comfort. One LED per key lights the individual characters - and they will never rub off! The Deck 105 key Legend measures 18.5" long x 7" deep x 2" high (with feet raised) and weighs 3.5 pounds. And as always this Deck carries our 1 year warranty and a 30 day money back satisfaction guarantee! Green backlit, linear keyboard. The keyboard is PS/2 compatible and requires a PS/2 keyboard port. A 6 pin mini-DIN to 5 pin DIN adapter cable can be purchased from 3rd party vendors if your PC has a 5 pin DIN receptacle. Power-down your system before attaching data cord to the keyboard port of your PC. The keyboard is now ready to be used. The keyboard uses the host computer’s operating system software drivers and therefore does not require custom software drivers to be installed on the host computer prior to use. This device is designed for use with any computer with a USB port running Windows 7, Windows Vista, Windows XP, Windows 2000, Windows Millennium Edition, or Windows 98, and Mac OS9/OSX. It has also been tested on several (but not all)Linux distributions and found to work properly. The keyboard uses the host computer’s operating system software drivers and therefore does not require custom software drivers to be installed on the host computer prior to use. driver should be found on your operating system disk. Please follow your system’s prompts. The device is now ready for use. Mac users should note that the Num and Scroll Lock keys will not function with the Mac OS. Also, the cursor functions are not supported on numeric keypad keys. two ways to change the brightness level of the keyboard. The first step in either method is to press and hold the “Fn” key down; it’s located just to the right of the spacebar. The first method incorporates the “up” or “down cursor” keys to brighten or dim the brightness respectively. With the “Fn” key held down, if you press one of these cursor keys, the brightness will step one level in the corresponding direction. If you continue to hold the cursor key down, the level will continue to step in that direction at a rate of about 3 steps per second. However, there is no “roll-over”. For example, once you reach maximum brightness, the level will not “rollover” to off and then continue getting brighter. This first method of changing the brightness is relative – you don’t know your current brightness level - you just want to either brighten or dim the brightness. The second method is absolute – you know the brightness level that you want and you want to get there directly. The method incorporates the numerical keys located just below the function keys. Again, start by holding down the “Fn” key, then press either “0” for “off”, or “1” – “7” for “on” brightness levels. No information will be sent to the PC while the “Fn” key is held down and either the “up” or “down cursor” keys, “0” or “1” – “7” keys are pressed. In other words, the keyboard doesn’t tell the PC these keys are being pressed. It also doesn’t matter which key you release first. However, any other key press will be reported to the PC regardless of the state of the “Fn” key. 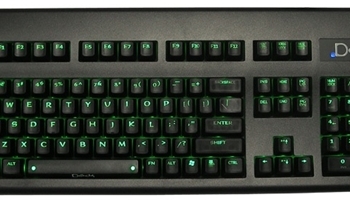 The keyboard has non-volatile memory to save the backlighting level as well as the brightness mode of the Num, Caps and Scroll Lock LEDs (status LEDs). There are two status LED modes. The first mode has the status LEDs dim along with the backlighting LEDs of the keys. The second mode is a “daylight” mode in which the status LEDs remain bright at all backlighting brightness levels - even if the backlighting is turned “off”. Please note that the status LEDs will dim slightly as the backlighting levels decrease toward level 1. The status LED mode is toggled by pressing “Fn” followed by “Caps Lock” key. Just as with the dimming operation, no “Caps Lock” key information is sent to the PC when the “Fn” key is down. If the non-volatile memory fails, the default power-on settings are level 7 brightness and the status LEDs dim along with the backlighting of the keys. This device operates from +5Vdc +/- 10% and draws 500mA maximum.